From the very first chapter it is very clear what kind of book this will be: a cruel, bloody, deceptive and deliciously morally grey. When Jude’s parents get killed right in front of her eyes, she and her two sisters are whisked away to grow up and live at the High Court of Faerie, to live with their parents’ murderer (who also happens to be the father of one of them) as a new family. But since they are mortal, life with the fey is immensely tough, as many of them despise mortals, and Jude and her sisters face a lot of extreme bullying. What I adored about the story first of all is the relationship between the sisters and how each sister deals with this massive thing differently. Vivi, the eldest, just wants to return to the mortal world and live with her human girlfriend. Taryn just wants to fit in and marry to find her place. But Jude is ambitious. Despite her parents’ murder, despite her constant fear and despite the bullying, she considers the world of fey her home. And she wants to earn her place, wants to gain the power she needs so she doesn’t need to fear again. Prince Cardan, who is every inch the cruel prince the title suggests, is mean, drunk and selfish. And yet… I am as drawn to his character as Jude is. I started off hating him as much as she did, and though we did not get the dreaded ‘misunderstood bad boy’ trope shoved at us (for which I thank you so much, Holly), I do still need more of him. I even think I ship it? The jury’s still out on that one though. Either way, I just want to point out how deliciously complex, multi-dimensional and morally grey his character, as well as EVERY single character in this book is. I also can’t review this book without mentioning how wonderfully the world of the fey comes to live while reading. The worldbuilding is so exquisite, from the actual creatures and laws of nature to the politics behind it all. This was my first Holly Black book, but her writing felt so vivid and natural that I am intrigued and ready to try out more of her books so I can dive into other worlds like this. Plotwise, don’t expect a dull moment while reading this book. From the bloody first chapter until the ending that left me reeling, this story is filled with twists and turns, a whole lot of political intrigue, deception and betrayal and quite some death. And even despite the fast pacing and the action on every page, the characters still manage to shine just as brightly as the plot, which I can only applaud. I’m kind of kicking myself for reading this so quickly after its release date. Because now, all I can think about is the next few books. And the wait is going to be excruciating. 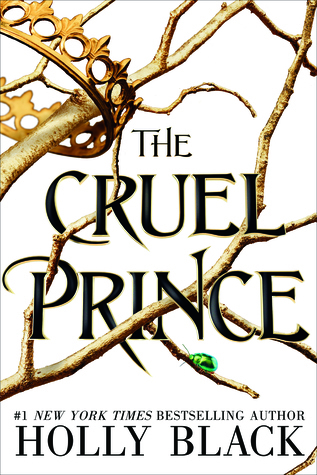 HAVE YOU READ THE CRUEL PRINCE? WHAT DID YOU THINK ABOUT IT? There`s so much buzz surrounding this book. Normally I`m afraid to read new releases because of the hype. But the plot and characters sound so good. I`m so glad you mentioned the fact that it has a morally grey set of characters, definitely sealed the deal with that one. I wasn`t going to read it at first, but now I might pick it up. Great review! Yes, usually the hyped books end up disappointing me, but this one I thought was worth all the hype 🙂 The morally grey characters especially! Hope you’ll enjoy it if you decide to pick it up. I’m currently reading The Cruel Prince with a friend. So far we’re both really enjoying it. I’m excited to read more!! I agree with you, it was incredibly entertaining, and I love that characters have motives for doing what they do (they’re ambitious, they’re being manipulated, they’ve been taught to act like that…) it’s just that -reasons- and not justifications for their actions. The characters can do something horrible while having mostly good intentions, or something nice to hide their awful real agenda. It’s fantastic! Alright, I was a little nervous with all the hype surrounding this book, but I think I might have to give it a go? I’m not huge on fairies for the most part, but it sounds like this might just be one of those rare exceptions 😉 Except that cover though. Ugh. Still not my fav. Rebeccah @ The Pixie Chronicles recently posted…Is Indie Publishing “Less Than” Trade Publishing? I’ve heard so much about this book and it does look amazing. I ADORE morally grey characters, and a strong sister relationship also sounds brilliant. Also, those quotes are incredible! I’m so glad to hear that this one lived up to the hype! I have seen so many incredible reviews. I know I will be reading this one – when three are out. So probably not for a while. So happy you loved this one! Oh dearieeee!! I can’t wait to get my hands on this book, everywhere I look, people are raving about it and I am sooo glad you loved it too!! Poulami @ Daydreaming Books recently posted…Review: The Upside of Unrequited by Becky Albertalli || Where Every “Side” was Relatable!! Oh yes, I loved it so much <3 Hope you'll love it as well when you get to it! I’m totally going to read this one. We normally love similar things and if you AND Danya are raving about this one I’m in… It’s on my TBR for next month!!!! !